In 2014 Trent Rivers Trust completed a four year program of invasive species control along the Gilwiskaw Brook and River Mease, working with farmers and community members to control the invasive species Himalayan Balsam from the banks of the River Mease. 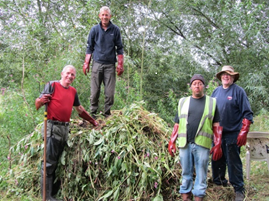 The result is a greatly reduced the abundance of Himalayan Balsam providing an opportunity for the native river vegetation to recover from this dominating plant. Himalayan Balsam has been widespread along the banks of the river in recent years. It grows very quickly over the summer months out competing the bankside native flora resulting in poor species diversity, but dies back to leave bare ground over the winter months which is prone to erosion. For further information please view this fact sheet.